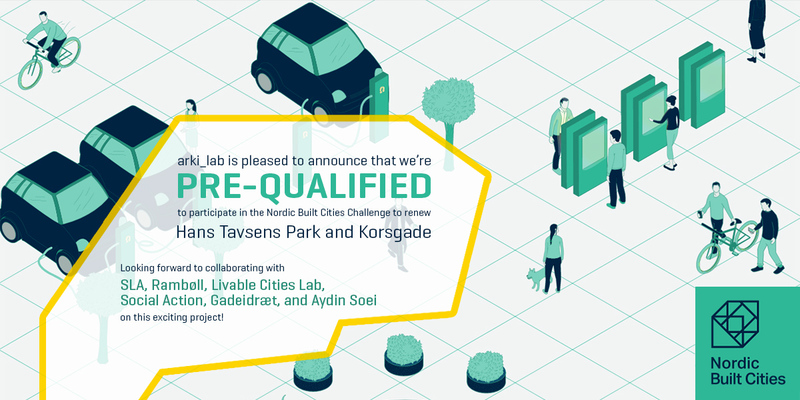 We are very excited to share the great news that we are prequalified to participate in the Nordic Built Cities Challenge, under Nordic Innovation : CLOUDBURST AND CULTURE. The Challenge consists of six local competitions, in Denmark, Faroe Islands, Finland, Iceland, Norway and Sweden. The goal is to develop smart climate adaptation solutions for the dense city that also contribute to livability and social and cultural development. “Thus, we call for solutions that are truly adapted to local needs, and display deep knowledge of the sites complexity and potential. One salient objective, and a good place to start a livability analysis, is the expressed local desire of opening up the area around Blågård School. We also encourage participants to work closely with existing networks in all stages of the planning process, in order to get insights into local needs and seek to strengthen these networks further”. We are very happy to be able to share our local knowledge and to work closely with the existing networks and our interdisciplinary collaborators. Our team is a unique combination of firms with extensive international experience with cloudburst management and landscape architecture. It combines heavy, technical ability with a sensual and nature-based design approach and an understanding of Nørrebro’s uniqueness, social synergy, and commitment. The Danish competition offers a two-sided challenge, addressing 1) climate adaption (CLOUDBURST), and 2) social and cultural renewal (CULTURE). 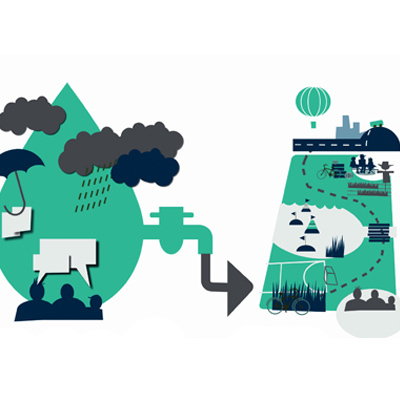 The cloudburst challenge addresses the problems that Copenhagen experienced in recent years with severe rainstorms. Copenhagen has a strong focus on developing smarter solutions for managing the increasing amounts of water, and Hans Tavsens Park and Korsgade play a crucial role in the city´s plan. The park should be used to collect rainwater, which should then be directed through Hans Tavsensgade and Korsgade into Peblinge Lake. The programme addresses innovative and sustainable climate adaptation with multifunctional facilities for a livable urban space. The cultural perspective calls for safer traffic solutions on Korsgade, especially for the pupils of Blågård School, and combining this with rainwater solutions. Hans Tavsens Park should be redesigned to create a richer cultural life and local ownership. Also, Hans Tavsens Park and Blågård School should be better linked, with a focus on multifunctional street design. We look at Cloudburst and Culture as a great opportunity to renew one of Copenhagen’s most diverse and vibrant neighbourhoods. It is an important and complex task that requires great skill and experience in many disciplines: landscape architecture and urban design, engineering and LAR, city life and security, promoting initiatives, recycling philosophy, social innovation and – not least – great expertise in value-added cloudburst solutions and in-depth awareness of local cultural. We are very happy to be a part of such a strong team, and We are looking forward to collaborating and exchanging ideas with the other teams and wildcards. The process already takes off next Tuesday, where we are headed to the first innovation workshop out of three. We will keep you updated!